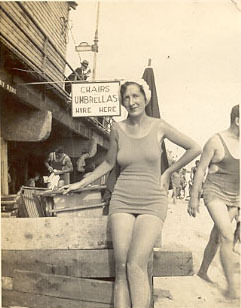 Most photos on this page date from 1900 to 1930. 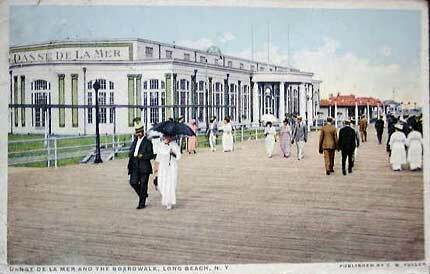 Thanks to Ed Gloeggler, a fellow Long Beach photo collector, for his contributions here. His photos solved some mysteries, and created some others. 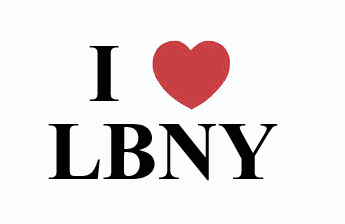 Enjoy Long Beach as it once was! 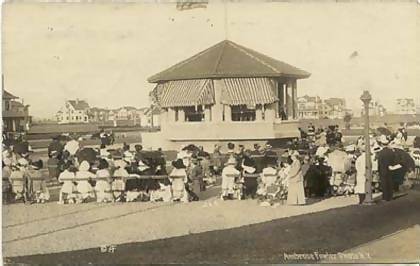 The National Bathing Pavillion as it appeared in 1909. The Hotel Nassau is just out of the photo on the right. This building was later replaced with another larger building, you will see below after it was destroyed by fire sometime prior to 1917. This was 1912. You can see the old Bathing Pavillion still stands in this photo (on the left). This was 1917. You can see this is a completely new bathing pavillion standing in the same spot as the original (above photos). A much larger building it seems, to handle Long Beach's new found resort status no doubt ! The Hotel Nassau is down to the right. This was postmarked 1900 !! It could be anywhere in LB, But my bet would be at the old Long Beach Hotel. 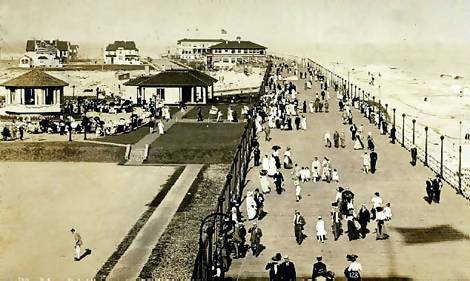 There just was not that much else around in that year that would draw a small crowd of people and have constructed boardwalks over the dunes. I removed the writing from the front of the card digitally for clarity.. but the person who wrote it wasn't too thrilled with LB in 1900 !! The note read "The death like silence can be heard for miles around" (then, with an arrow pointing at the ocean) "If only all of that were Bud, gee !! (did they have Budweiser then ??) 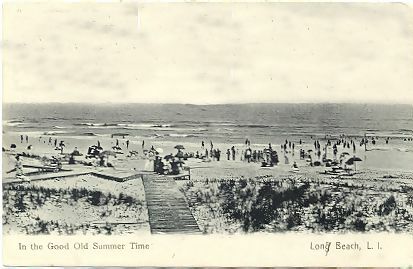 On the bottom, next to the card caption "In the good ole summer time", he wrote "not yet, but soon" and you can see where he scratched out the "g" in Long and replaced it with an "e"... Lone Beach !! Guess this guy didn't come back the next season !!! 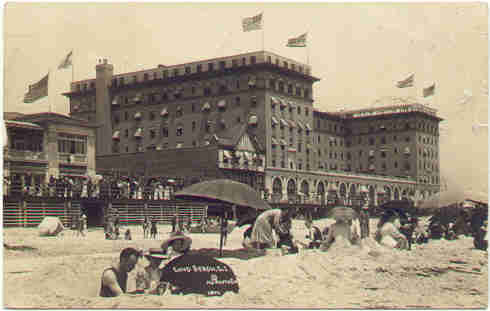 The boardwalk, looking east, with the Hotel Nassau on the left. What a great photo !! Click here to open this picture FULL SIZE in another window. You'll be able to see the detail and the dress of the day more clearly !! The band stand seen in the photos below is just barely visible at the end of the hotel. This was known as the Band Stand, Music Pavillion and Music Park, depending on the source. It stood immediately to the east of the Hotel Nassau on National Blvd., on the east side of the east boardwalk ramp...whew.. thats alot of east !! It did not stand for many years, as by the early 20's, the Castle by the Sea Baths and Theatre stood on this land. 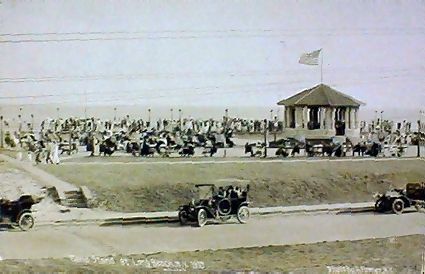 Here's another shot of "The Band Stand at Long Beach, 1910" as the caption on this photo reads.. This one was shot standing at the end of National Blvd looking east toward the boardwalk. The Hotel Nassau would be behind you and Broadway to your left. (see the boardwalk lights in the background). Sorry about the quality, this one wasn't very clear. 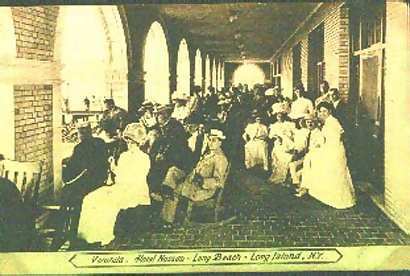 This one is captioned "Veranda, Hotel Nassau, Long Beach, Long Island, NY." Some well to do folks obviously! This shot was taken in 1910. 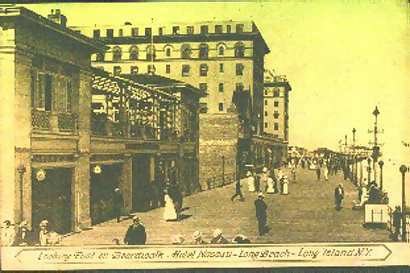 This shot is captioned "Looking East on Boardwalk, Hotel Nassau, Long Beach, Long Island, NY". 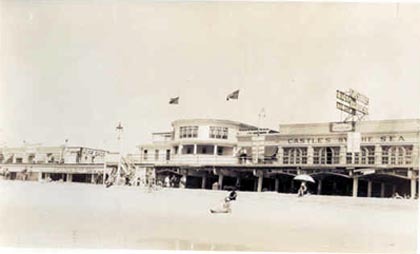 The old National Bathing Pavillion is the first building on the left. This was 1910-11. This photo was taken from the west tower of the Hotel Nassau looking east. 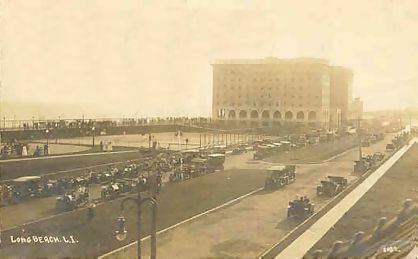 It would have had to have been after 1917, as I can see parts of the Castle by the Sea Dance Theatre (Dance Hall) on the left (notice the white building and the columns beyond it). The deck of the boardwalk has also been changed to concrete here. 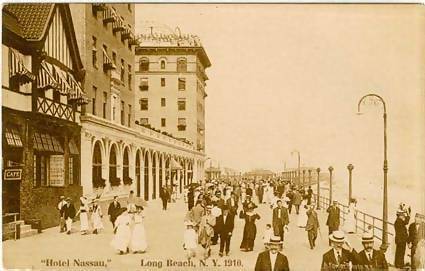 The dark building in the far distance I believe is the group of buildings that include the Dauville and Trouville Hotel at Long Beach Blvd.. This is an actual photo I obtained of the Castles by the Sea bath house, in the center with the rounded porch..I believe this may be sometime around 1920. 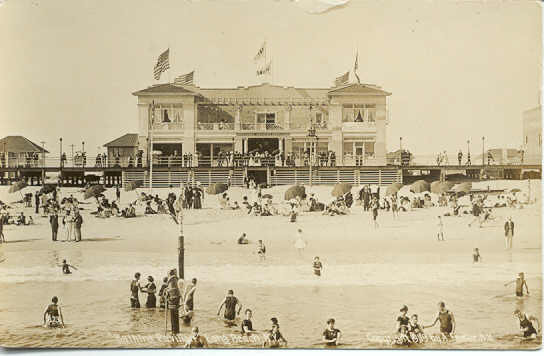 It later became the Mirimar Hotel. Roll your mouse over this photo to see a second image that was postmarked in 1923.. The large structure to the rear is the Castle Theatre, an entertainment theatre (summer stock and movies) The gentleman that owned it was a Mr. Schloss (German for Castle) being very enterprising (Daughter 's tape) he joined his theatre to Castles by the Sea Dance Hall, circa 1913... Before the fire in the 30's there was also Castle Baths & pool (seen in the photo here) .....famous surfer Duke Kahanomoko (sp) did an exhibit there in the 20's !! email me if you can provide any info on this entertainment complex ! 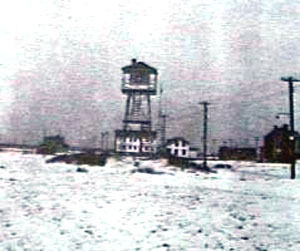 This is a shot of the old Coast Guard Station from the LB Historical Society archives. (it is the larger building in the background) This is not the original 1849 US Livesaving Station. I have been informed by the Historical Society that this one was on Lindell Blvd and Beech St. and the property later became the home of Thomas Cooke, LB's tax assessor. The structure remained for years as a Life Guard and first aid station. The Coast Guard decommissioned it in 1937. I also contacted the Coast Guard Historians office for more info on the Life Saving Stations.. 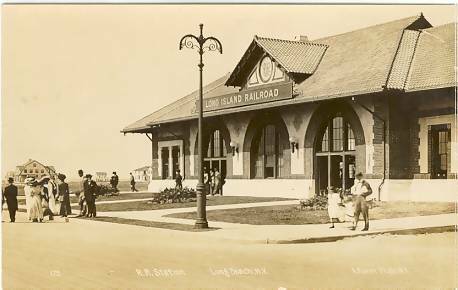 I found this out: The Long Beach Station was built in 1849 . In 1878 the coordinates for the station were 40.35.03 N latitude and 73.39.09 W longitude.. These coordinates laid right on 61 Lincoln Blvd. Old maps I have obtained show the station to the NE of this location by approx. 1/4 mile or so, closer to the bay and what was then Luce's Inlet. This original site was abandoned and a new one acquired in 1888. It's coordinates in 1915 were 40.35.10 N 73.40.45 W, which would put the new site at roughly the Lindell and Beech site, as the Historical Society told me. Just FYI, the Point Lookout station was located between Parkside and Baldwin Ave, south of Beech in 1872 at 40.35.20 N 73.35.00 W. The station was destroyed in a severe storm in 1908 and a new one was constructed without regards to boundaries or descriptions. 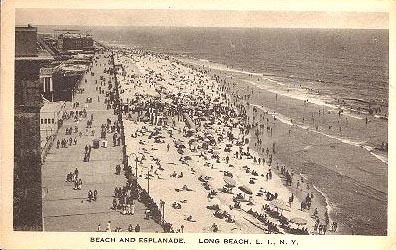 It is interesting to note that Long Beach was split by 2 inlets in the late 1800's. Luce's Inlet in the east, near Blackheath Rd it appears, and Hog Inlet (later East Rockaway) which originally was in the vicinity of New York Ave and opened directly into Broad Channel ! Luce's Inlet shoaled over and probably was not navigable prior to about 1880, East Rockaway Inlet began it's move West about 1896 according to maps. There was an intense hurricane on Aug. 23, 1893 that could have began this process. There are some photos of what the original stations looked like on Page 7.
photo courtesy of Lowell Taubman, LB HIstorical Society // Location and documentation of the later use of this structure provided by Roberta F, LB Historical Society. 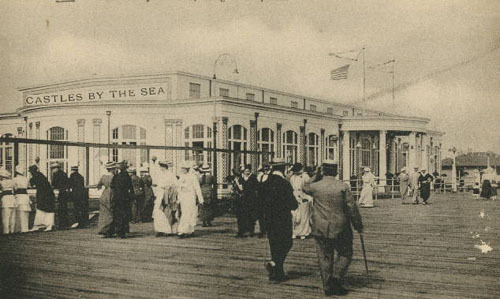 The Castles by the Sea Dance Hall, as it appeared in 1917 after being renamed by Irene and Verne Castle. This is a great shot.. what are the people on the left looking at ?? probably the tennis courts belonging to the Hotel Nassau or perhaps it's construction work on the bath house which is absent in this photo ??? In later years the front of this building was extended and a theatre and other stores were added.. that is what you see in the "rollover image" above. 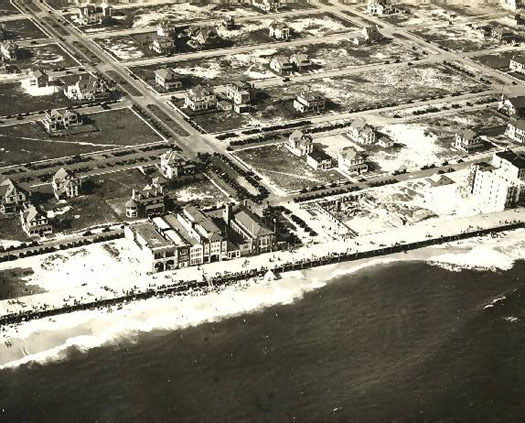 This is a dynamite and rare very early aerial photo of Long Beach Blvd and the surrounding streets !! It solved some questions.. first off, the cluster of buildings you see on the boardwalk are the bathouses that include the Dauville and Trouville, who's location I didn't know before this. 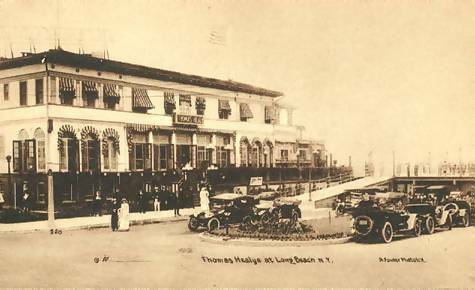 Next to them, on the east side of LB Blvd ramp is a lot with rubble and the remains of a foundation.. this is what is left of the Tom Healy Inn, also known as the Long Beach Casino, and pictured below .. many other homes in this photo still survive today.. We now believe this was taken prior to 1925. 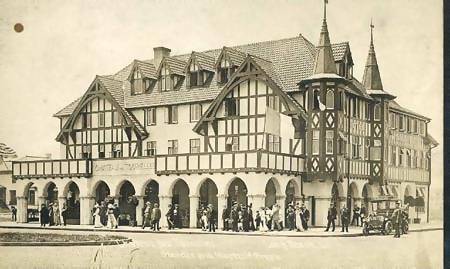 Howie Hemsley provided this documentation : 57 Long Beach Blvd, the Commodore Apartments were built by 1925. It had an open stairway and the view from the penthouse was absolutely breath-taking. It stood on the Northwest corner of LB and Shore Rd facing east with a grocery store and a laundermat on the first floor. On the Southwest corner of LB and Broadway, just north of 57 LB Blvd, stood the Buckingham Apartments, 170 East Broadway. It was built in 1929 or 1930 or 1931. It had fire resistive hallways, enclosed stairways and wood floors and joists. The NYS Multiple Residence Law came out in 1929, which required these items related to construction. The Commodore did not conform to the NYS MRL. Just east of LB Blvd on the north side of the would be another NFP apartment house, the Tudor Towers or the Golden Gate Apartments, 215 East Broadway. It too has enclosed stairways and fire resistive hallways. If I recall correctly, it was also built in 1929 and doesn't show up in the picture. It still stands today. Another great, old shot looking east from the Hotel Nassau (notice the flag's shadow on the boardwalk). The Music Pavillion is on the left and just to the right of it are the original Long Beach offices, later moved to the National Blvd City Hall complex. 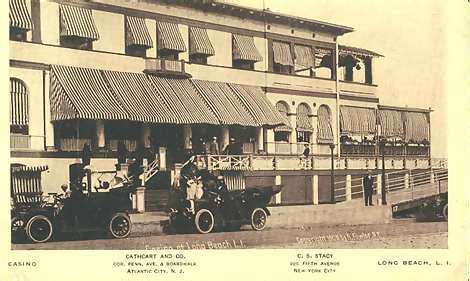 This shot prior to 1917, when the Castles Theater was build on this land. In the distance you can see Tom Healy's / the Casino from the pictures above ( I put a red star above the building) The buildings to it's right ( with the dark roof) are the Dauville and Trouville and other bath houses. 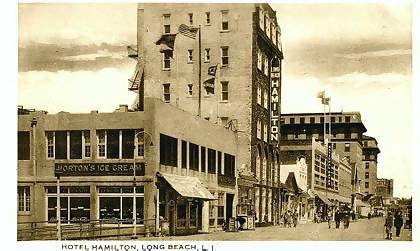 The Hamilton Hotel and Horton's Ice Cream on Magnolia Blvd. 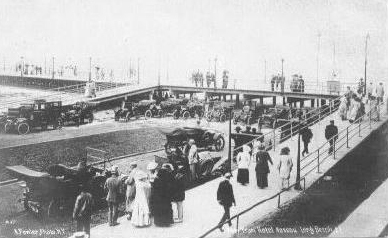 year unknown, but would have to be around 1917 as the new National Bathing Pavillion is in this photo..the old one was in existence until at least 1912. 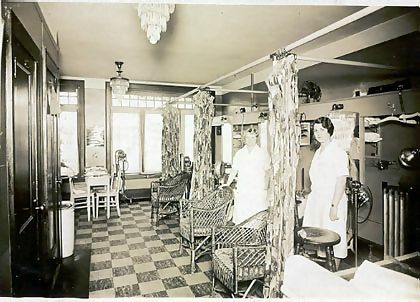 Can anyone supply any information about a beauty salon that might have been across from the Long Beach Bus Company around 1932? Bob's speculative guess at the name of the place is along the lines of "Helen McCulloch" or something like that. 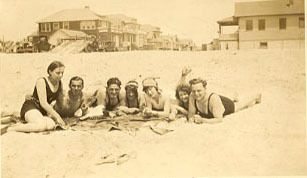 This photo taken about 1927-1929 also. 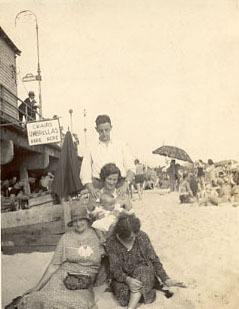 The older woman on the right is Mary Foster, the others are unidentified. 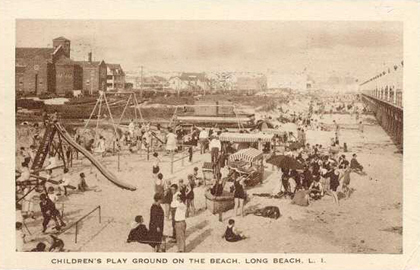 A playground behind the boardwalk at New York Avenue. St. Ignatius Martyr Catholic Church is on the left. 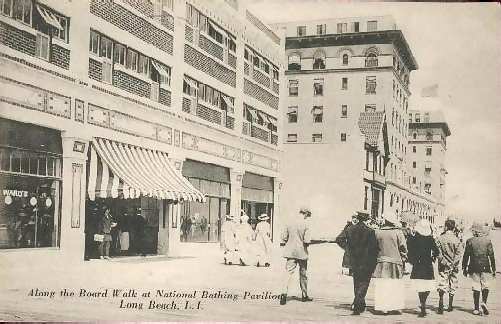 National Blvd at the Boardwalk, circa 1910. Taken from the Hotel Nassau. This is looking west down Broadway, circa 1912. The Hotel Nassau is shown. This photo was probably taken from the old Pickwick Tea Room, which stood at 105 Jackson (Edwards) Blvd. This is 1925. You're looking at a Reo gasoline powered trolley. The person is unidentified. 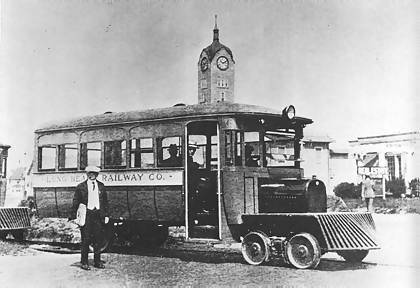 The trolley line in Long Beach at one time ran down Park Ave from the West End to Maple Blvd. The tracks were also pictured on Beech St in the West End.. They were laid in the early 20's and torn up about 1930. The traditional buses took the place of the trolley lines. Notice the old City Hall clock tower in the back !